This DVD is a comprehensive introduction to poi. You will learn poi dance combinations that range from simple to advanced and will be introduced to belly dance veil poi. Originally performed by the Maori in New Zealand, poi and fire dancing are now seen at festivals, raves, concerts and nightclubs around the world. Whether you are performing on a big stage or simply dancing for yourself, poi will add a hypnotic and colorful dynamic. This DVD is a comprehensive introduction to poi. Because it was filmed in front of mirrors in a dance studio, you can see each move in its entirety from both the front and the back. Each trick is broken down in easy-to-understand segments, and slow motion video takes the mystery out of the moves. 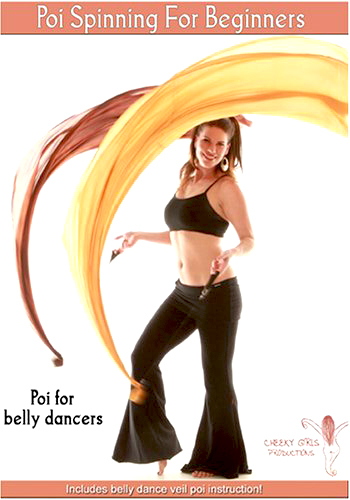 You will learn poi dance combinations that range from simple to advanced and will be introduced to belly dance veil poi. Belly dance veil poi was invented by Dana Beaufait and is performed widely by the Bellydance Superstars and Aziza. The veil poi segment of this DVD demonstrates how the poi moves can be incorporated with silk veils for a dynamic veil dance! The video was great for beginners and easy to follow along. Performances were also included in the video so you can learn different choreography.